I believe very strongly that every child needs to be vaccinated in order to stay healthy and prevent an outbreak of infectious diseases. Many parents disagree with me and feel that vaccines cause adverse side effects. I have chosen to vaccinate all my children because I want them to be strong and healthy and not have to suffer with a preventable disease like polio, mumps or hepatitis. I also don’t think there is enough research and evidence that vaccines cause long term health problems in children. The controversy behind vaccinating children is brought up once again in the new book, The Solution, by Cilla Whatcott and Kate Birch. They believe that homeoprophylaxis is a safer alternative to modern vaccinations. If practiced correctly parents can keep children healthy through developing the immune system. Homeoprophylaxis is the process of training your child‘s immune system to fight off disease through giving him a tiny dose of the disease. If you don’t have a basic understanding of homeopathy you might find The Solution very confusing. Homeopathy is a medical practice founded by Samuel Hahnemann on the principle that “like cures like.” That is, substances in a healthy person that produce the symptoms from which the patient suffers are used to treat the patient. Using homeopathy to heal illness may sound like a radical idea for some people. Through experience I know that this alternative medicine does work. But I am very skeptical about using homeoprophylaxis in the place of modern vaccines. In The Solution, Birch and Whatcott present a solution for families who are seeking a natural healthy alternative to vaccinations. 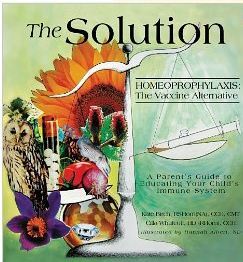 You can purchase The Solution : Homeoprophylaxis: The Vaccine Alternative on Amazon.com or at your local book store. *Disclosure: I received a copy of The Solution : Homeoprophylaxis: The Vaccine Alternative in exchange for this review. All opinions are accurate and 100% mine.